The journal is an electronic journal that publishes topics related to the field of Social Sciences. Articles are published in Turkish and English languages. The articles sent to our journal for evaluation should not have been published before, not accepted for publication, not in the process of being evaluated for publication. The responsibility of the works which are in the evaluation period and published are entirely up to the author(s). 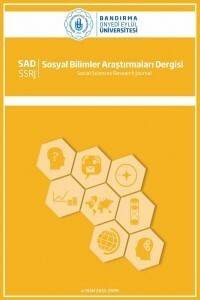 Copyrights of published works belong to Bandırma Onyedi Eylül University Social Sciences Research Journal. The work to be published must be prepared and sent in accordance with the conditions set forth in the journal's writing rules and publication guidelines. The articles submitted to the journal are subject to preliminary examination in terms of form and content. The articles that are appropriate in form and content are presented to the editorial board for appointment of an arbitrator. After the evaluation process, the arbitration process takes an average of 3 to 5 weeks. If the articles reviewed by the Editorial Board are found appropriate, at least three arbitrators are appointed. In the light of the reports from the arbitrators, it is decided to publish the article, to ask the author(s) for correction, additional information and abbreviation on the report frame or not to publish the article. If two positive and one negative report is given by the arbitrators, the relevant work can published if it is deemed appropriate by the Journal Editorial Board.